The High Elections Committee, another supposed election oversight body, is led by Minister of Justice, Islamic Affairs, and Endowments, Sheikh Khalid bin Ali Al Khalifa, a member of the Bahraini royal family. During his time as Minister, Sheik Khalid has suppressed Bahraini Shia Muslims through the destruction of their mosques and has seen that the Ministry of Justice, Islam is Affairs, and Endowments (MOJ) dissolved political opposition parties like Al-Wefaq and Wa’ad. 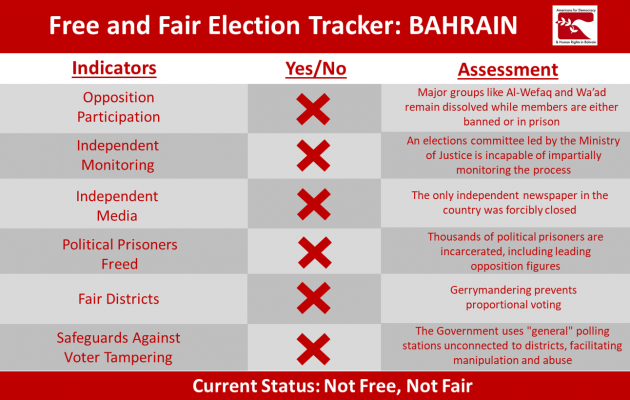 Under Sheikh Khalid, the High Elections Committee also supports the gerrymandering that occurs in Bahrain.